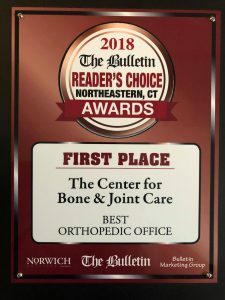 The Bulletin 2018 Readers Choice Award for “#1 Best Orthopedic Office” is given to The Center for Bone & Joint Care! We want to thank you all for voting us as #1 in Northeastern Connecticut. It’s because of you that we continue to grow and continue to provide the best care right here in the Quiet Corner.